Where do our graduates practice? You did what?!? Alumni, share your news. Sarah Mess, Certified Nurse Midwife, joined the Department of Obstetrics and Gynecology at the Medical College of Wisconsin in August of 2017. 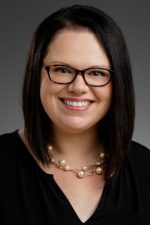 She received her Associate degree in Nursing in 2005, Bachelors of Science in Nursing in 2011 from Concordia University and her Master of Science degree in 2014, from Marquette University. While earning her Master’s degree, she worked as a Labor and Delivery nurse at St. Joseph’s Hospital. Sarah understands the importance of truly listening to her patients and taking the time to build a trusting relationship. Working collaboratively, she will help you address your unique health concerns in a compassionate and caring manner. With her advanced education and experience in lactation management, she works with every patient to create a plan together to best manage each individual’s situation. She is board certified by the American Midwifery Certification Board (AMCB) and by the International Board Certified Lactation Consultant (IBCLC). She is also a professional member of the American College of Nurse-Midwives (ACNM). Sarah sees patients in the Obstetrics and Gynecology department in New Berlin, Moorland Reserve location. She lives in Jackson with her husband and three children. She enjoys reading, farmers markets and cooking.